A popular "new" cut of Steak that is cheaper and surprisingly more flavourful than some more expensive Steaks. 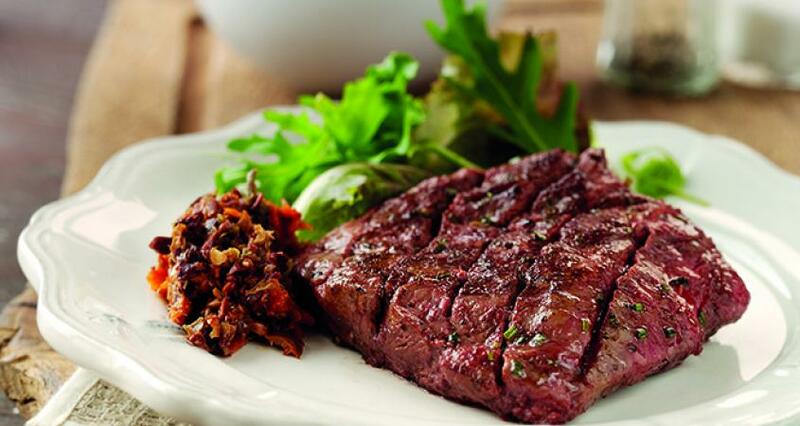 Flat Iron Steaks initially gained popularity in the US and have now come into very fashionable demand here. 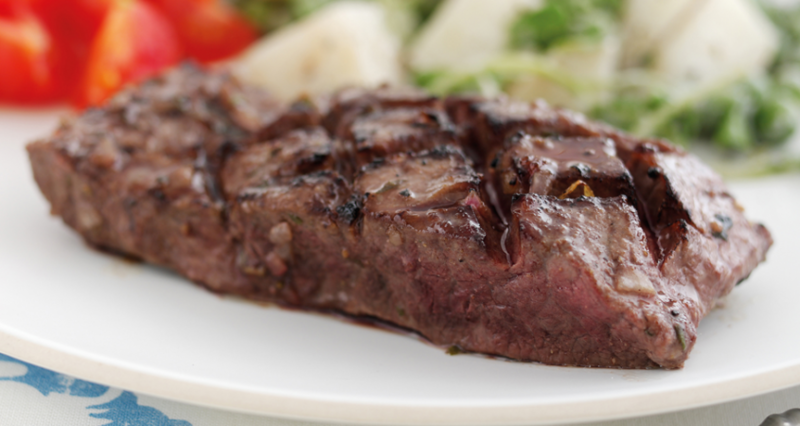 It was given its name because the Steak muscle is the same shape as the plate of an old fashioned flat iron. Also known as Butler's Steak, Oyster Blade Steak, Top Blade Steak, Feather Steak, Book Steak, Lifter Steak, Petite Steak - depending where you are - the Flat Iron Steak was developed by teams at the University of Nebraska and the University of Florida in the early 2000’s. The problem presented to these researchers was what to do with a waste cut of Beef from the shoulder of the animal. Though a flavourful and relatively tender cut of meat, the top blade roast has a serious flaw in the middle of it - an impossibly tough piece of connective tissue running through the middle. So after developing a method for cutting and presenting this Steak, these friendly scientists have offered to us an amazing cut of Beef. More than that, they have developed a nearly perfect Steak for the grill. The Flat Iron is uniform in thickness and rectangular in shape. The only variation is the cut into the middle of the Steak where the connective tissues have been removed. Also like Flank, Flat Iron Steaks are cut originally with the grain revealing long, parallel, evenly spaced muscle fibres. Although the cut should really be too tough to grill, by slicing the meat against the grain we shorten the tough muscle fibres and tenderize every slice. Which means it's a perfect candidate for grilling. 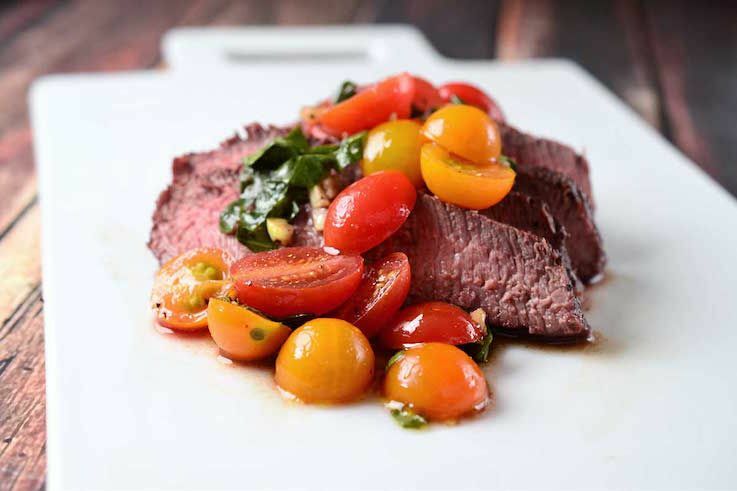 The Flat Iron Steak has a deep, rich beefy flavour with a bit of a bite - which makes it perfect not only on its own, but also as meat for many dishes. It is very similar to any of the Flat Steaks so anything calling for Skirt, Flank, Bavette or Onglet Steak will benefit from a Flat Iron Steak. This cut is best grilled over a medium high heat. We don't suggest going as hot as possible unless you have chosen a particularly thin cut. We like to get them thick so grill or fry at a little lower temperature to keep from charring the outside before it heats through the middle. 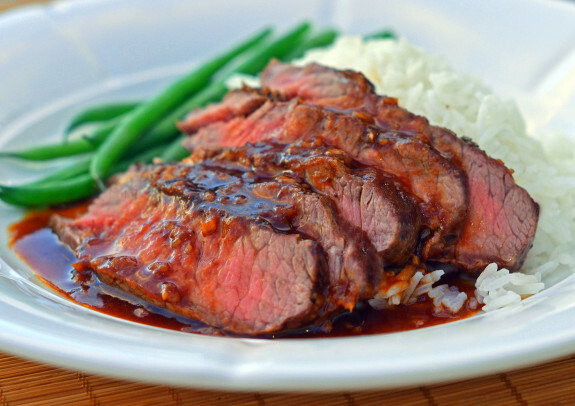 Like any non-loin Steak, the Flat Iron also benefits from marinating and is best if it isn't cooked too well beyond medium. Apart from our basic How to Cook tab you may want to consider these recipes. Heavenly - there is no other word to describe this! 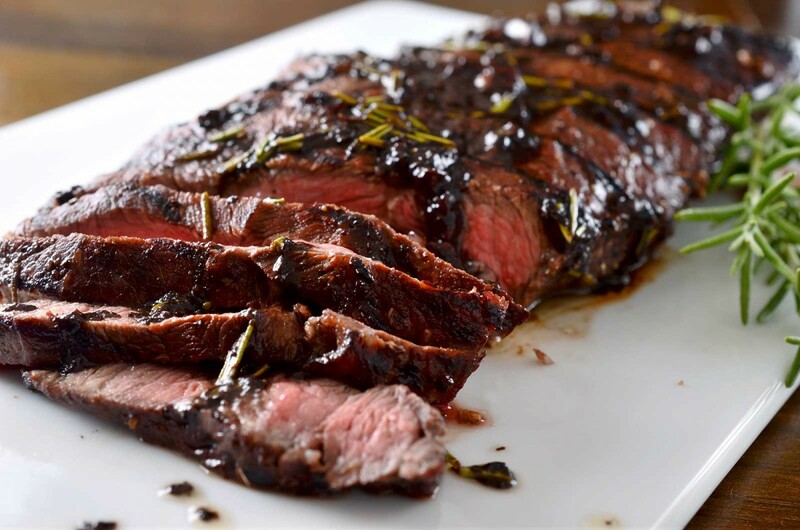 Marinated in Balsamic vinegar, red wine, Garlic and Rosemary - and when cooked - finished off with another dash of red wine - and then reduced down to a luscious sauce to spoon over the top. As we said - heavenly! Thrifty, moreish - and quick! Feel free to grill it if you prefer. An elegant dinner that is on the table in less than 30 minutes. 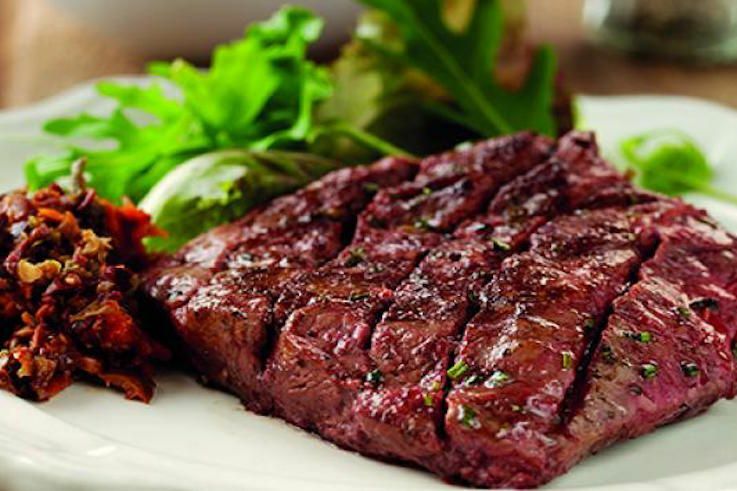 Mouth watering Flat Iron Steaks marinated to Perfection. Prepared with Red Onion, Mint, Thyme, Honey, Cumin, Lemon, and freshly milled Black Pepper. 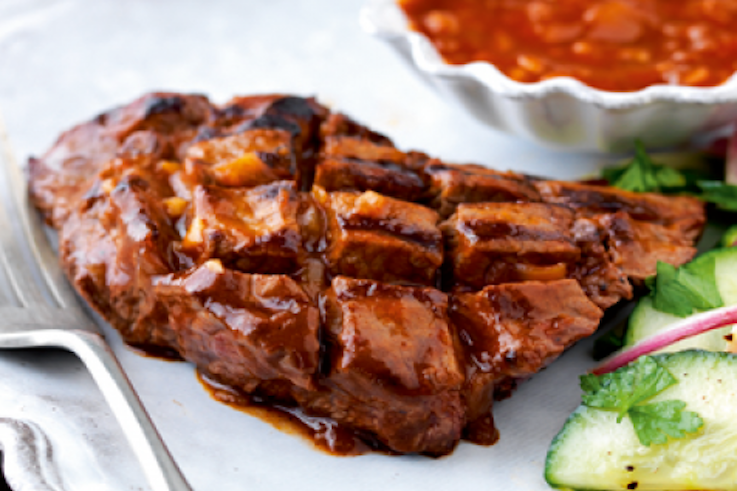 Ideal for the Barbecue, but also a great Thrifty alternative cut for those who love their Steak cooked in their favourite way. 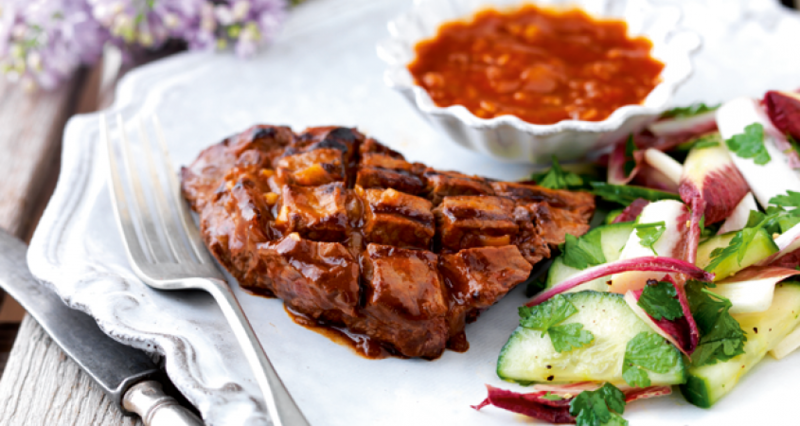 A fantastic Barbecue recipe with the sauce made from Onion, Garlic, Tomato ketchup, Honey, Cayenne Pepper, Dates and Lemon juice. Cooked with fresh Rosemary or Thyme leaves and served with a delicious Tapenade made with Olives, Garlic, Anchovies, Lemon juice and sun-dried Tomatoes. Perfect for the Barbecue - or under the Grill. Simply season with salt and pepper - that’s it! - then grill it - and your done! A recipe that lets the quality of the ingredients shine through. An amazingly simple, rustic - but gorgeous Summer meal!